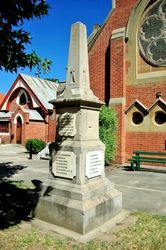 A monument commemorates members of St David`s Church who died in service or were killed in action during World War One. 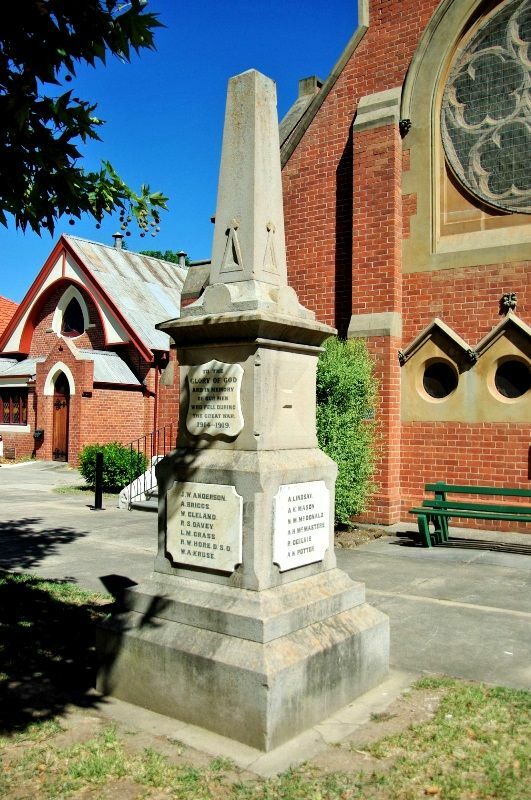 The memorial also contains a tablet erected in memory of the fallen from the Albury Congregational Church which was unveiled on the 23rd April 1922. 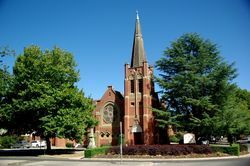 At last Sunday evening's service at the Albury Congregational Church Mr. George Arthur Thompson unveiled the beautiful marble memorial, on which was inscribed the words : — "Sacred to the Memory of T. Chandler. W. Chandler, F. C. Hallandal. A. Jackson. C. R. Spencer, who fell in the Great War, 1914-18. ", "All Ye That Pass By." Mr. Thompson, in a very fine address, said that in years to come, children, as they looked at the memorial stone, would ask questions, and the elder folk would tell the story connected witli each name. He urged the congregation to keep in mind those who paid the supreme sacrifice. Albury Banner and Wodonga Express (NSW), 28 April 1922. "All Ye That Pass By"